Healthy noshing at its best and a total crowd pleaser! Whether you’re in it for the game or just the food, every Super Bowl party needs a great spread! And this Buffalo Cauliflower Platter is healthy noshing at its best! Crispy, spicy and tangy Roasted Buffalo Cauliflower + Chickpeas, crunchy carrots & celery and a creamy Vegan Ranch Dressing for dipping. The combination is addictively delicious and will be a total hit! For more great Super Bowl food ideas, check out our favorite Super Bowl party picks! Easy Vegan Ranch Dressing Recipe adapted from Minimalist Baker. Spice up your Super Bowl party with this easy gluten-free and vegetarian snack plate! Crispy, spicy and tangy Baked Buffalo Cauliflower and Chickpeas, crunchy carrots and celery, plus a reamy Vegan Ranch Dressing for dipping. Healthy noshing at its best! 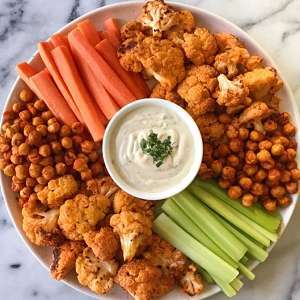 On a large plate or serving platter arrange Buffalo Cauliflower, Buffalo Chickpeas, carrots and celery with Ranch Dressing in the center for dipping.